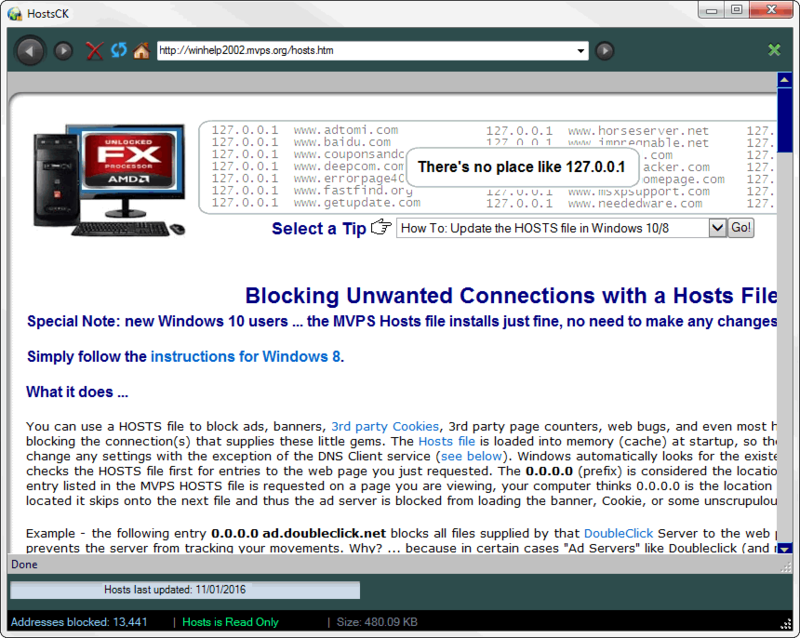 HostsCK is the free, easy, comprehensive way to maintain the Windows Hosts file. keeping you safer online without the need to add yet more plugins to your web browser. 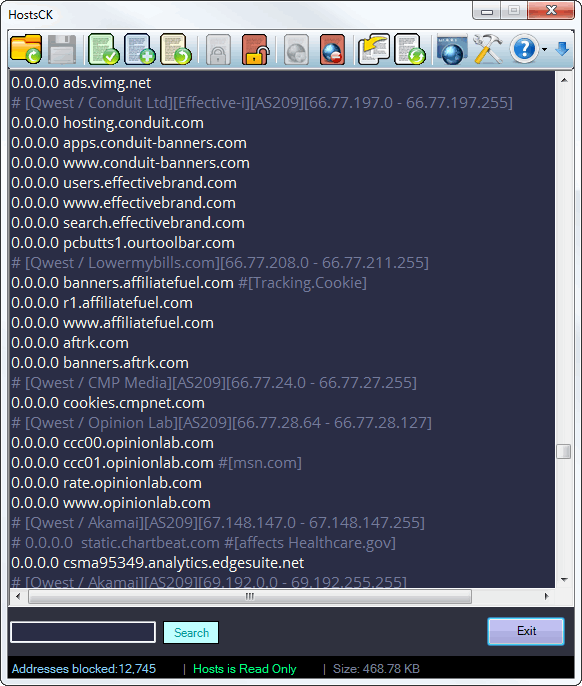 browsing by blocking programs from connecting to their home site. Easy to read the Hosts file. addresses being blocked or allowed. You can use any colour combination you want. You can also easily remove any or all comments. 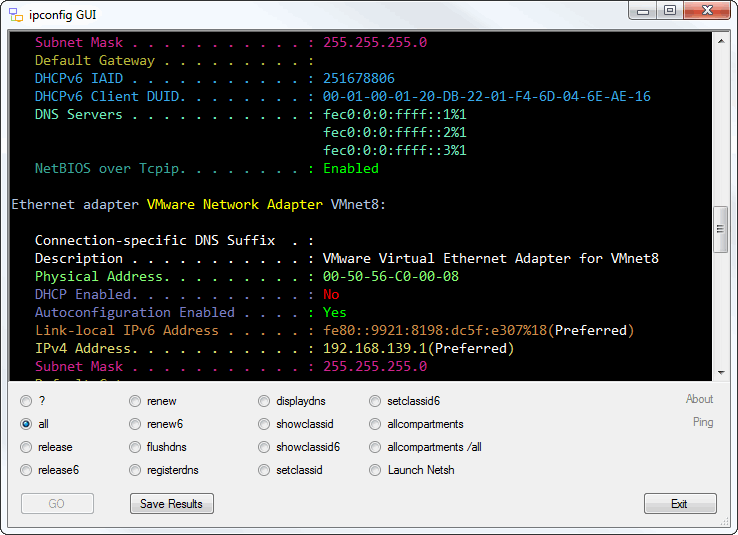 Easy to update the Hosts file. Save your own blocked or allowed sites. into the Hosts file when you have update it. You can save addresses to a whitelist. blocked when saving a Hosts. other programs deleting or modifying it and you can easily import your own lists. for the Hosts file in Windows Defender. HostsCK’s settings, about HostsCK, program help file and check for updates to HostsCK. removed. Saving the Hosts completes the change. import them back into an updated Hosts file when you save one. Search the Hosts file for hosts. The search box also acts as a command box. entries but this can be overridden by typing “;;check hosts” into the search box. block it in the Hosts file. colouring to have HostsCK read a Hosts file as fast as any text editor. 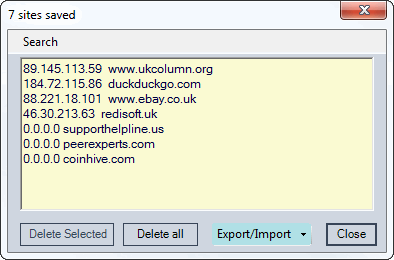 From the toolbar HostsCK can search the Hosts file for and remove duplicate entries. will be copied back to the file when it’s saved. 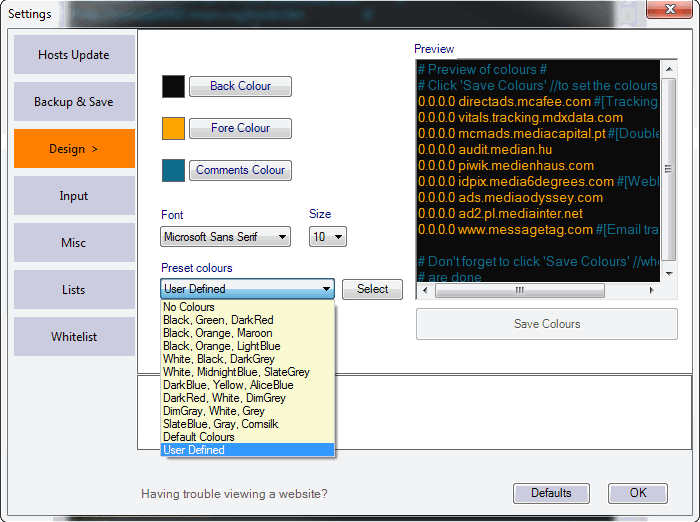 advantage of colouring results and makes saving results easy. Fixed: Correct language was not shown in some message boxes. Fixed: Font settings were not being loaded. Improved: HostsCK handles very large Hosts files much more efficiently. Added: You can now drag and drop a Hosts or Hosts.txt file on to the textbox to load it. displaying the textbox line number. Added: Greyscale colour scheme for the textbox. to read for low vision users. Full download needed. 570 1,430 rediSoft <img src="https://www.oldergeeks.com/downloads/gallery/thumbs/HostsCK1_th.png"border="0"> Sep 02, 2018 - 13:15 2.1.8.0 1.27MB EXE , out of 3 Votes.